U.S. Rep. Kevin Cramer says he’s ready for a tough fight to unseat Democratic Sen. Heidi Heitkamp in a race seen as critical for control of the closely divided Senate. Cramer easily defeated little-known Air Force veteran Thomas O’Neill on Tuesday. Cramer says primary elections are an “important step in process” and he hopes “voters will get in the habit of voting” for him in November. Cramer initially passed up the Senate race this year but said he changed his mind at the urging of President Donald Trump and others who saw him as the GOP’s best hope to defeat Heitkamp. Cramer says he’s focused on the race this fall, but he adds his “top priority” is his work as a congressman in Washington. Republican state Sen. Kelly Armstrong has won North Dakota’s U.S. House primary. Armstrong, an attorney from Dickinson, has strong ties to the state’s oil industry. He’ll face Democrat Mac Schneider, a Grand Forks attorney who had no opposition in the primary. Schneider served two terms in the North Dakota Senate before being unseated in 2016. U.S. Rep. Kevin Cramer has defeated a little-known opponent to win North Dakota’s Republican primary for U.S. Senate. Cramer easily beat Air Force veteran Thomas O’Neill on Tuesday. North Dakota Secretary of State Al Jaeger says he doesn’t expect any long lines at the polls during this primary election. Burleigh County Auditor Kevin Glatt says turnout is still “light” in Bismarck. Cass County Auditor Michael Montplaisir (mahnt-PLAY’-zur) describes turnout as “slow” in the state’s most populous county. Jaeger says there’s likely to be a lot more excitement in November’s general election. Republican U.S. Rep. Kevin Cramer is facing a little-known opponent in the Tuesday primary, but his campaign is focused on trying to unseat incumbent Democratic U.S. Sen. Heidi Heitkamp. Heitkamp doesn’t have a Democratic primary opponent. Local races are drawing voters in North Dakota’s primary election, but a big statewide race is on the minds of many. Republican U.S. Rep. Kevin Cramer faces little-known opponent Thomas O’Neill in the primary as he looks ahead to a fall Senate race. Incumbent Democratic U.S. Sen. Heidi Heitkamp doesn’t face any primary opponent. 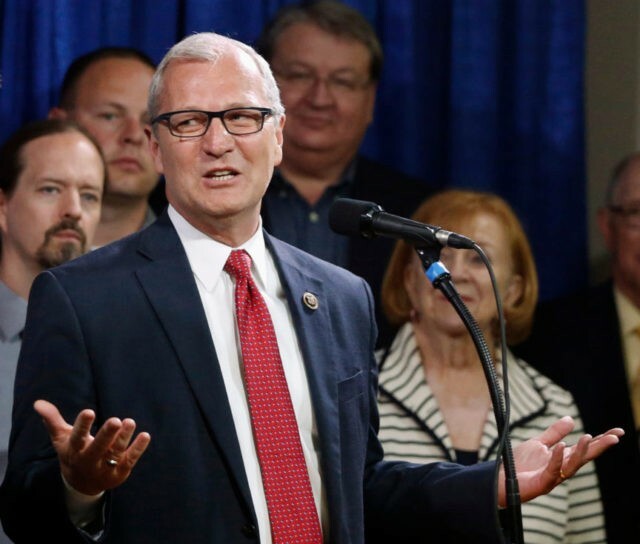 North Dakota Rep. Kevin Cramer faces a little-known opponent in the primary election as he looks forward to what’s expected to be one of the nation’s top Senate races in the fall. Cramer’s opponent Tuesday is Thomas O’Neill, an Air Force veteran who didn’t mount a major campaign. The other notable statewide race is for Cramer’s U.S. House seat. State Sen. Kelly Armstrong was seen as a heavy favorite over a pair of lesser-known and lightly funded opponents.